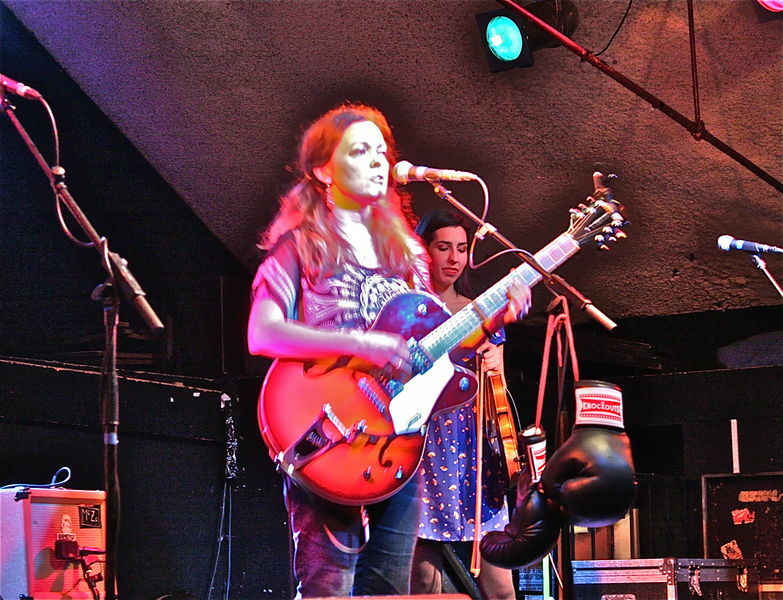 Rachel Harrington is already a bit of an old hand when it comes to touring the UK having come across the pond various times on her own performing her solo material. The singer-songwriter has an impressive back-catalogue of self-penned songs that cover the whole gamut of Americana roots music (check out albums like City of Refuge and Celilo Falls for instance). However, for this tour, Rachel has hitched up with some cowgirl ‘pardners’ on a more equal footing to form the band The Knock Outs. The music is more definitively in the Country camp in terms of genre. However, worry not, Rachel’s keen eye for life’s little idiosyncrasies - and often its absurdities - ensures that the lyrics are as sharp, pert and pertinent as ever. 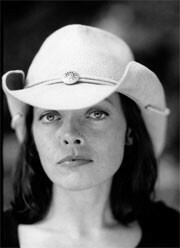 And often very humorous indeed - but beware, this is Country Soul with a smile and a sharp dig to the ribs. Rachel Harrington is originally from Eugene, Oregon, but has since drifted north to Washington (State, not DC) where she has created three acclaimed albums, with each song a hand-crafted gem mounted on a musical crown. Word-smithery at its finest you could say. As her publicity has it: “imagine Loretta Lynn playing Otis Redding Songs in a garage in Seattle - in 1963”. "this is Country Soul with a smile - and a sharp dig to the ribs"
As for the rest of the girls, Aimee Tubbs on drums is from the rolling hills of the corn state Iowa (home to such rarities as the Pallid Sturgeon, The Topeka Shiner and the Higgins’ Eye Pearly Mussel - no, don’t ask). Moe Provencher on bass is from that acclaimed C&W stronghold: the Commonwealth of Massachusetts (ahem!) and Alisa “Legs” Milner on fiddle is from Washington State itself. 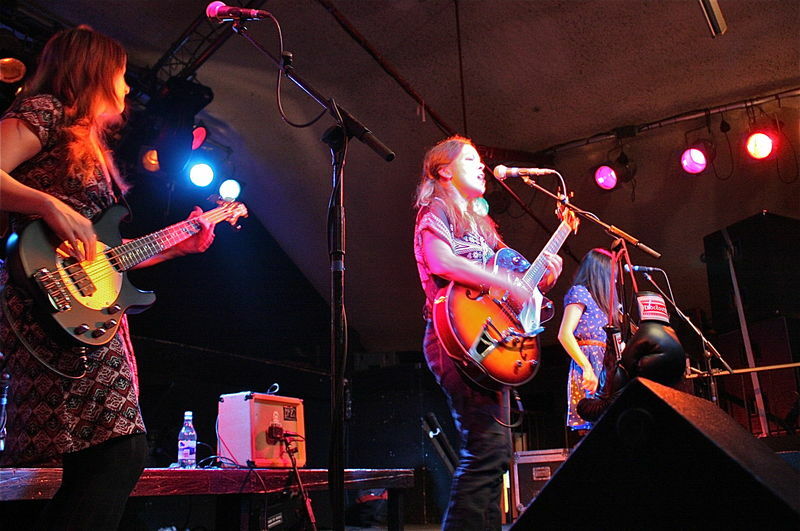 The band is based in Seattle and most of the tracks on this tour are taken from Rachel Harrington & the Knock Outs' self-titled debut album which I immersed myself in for a few days before the gig. Now, I’m not at all any kind of Country music expert and have always found it hard to connect emotionally or culturally with much of it (although, bizarrely I feel quite at home with Gospel, avowed atheist that I am). However after force-feeding it to myself (my liver will probably make quite a decent C&W pate now), I started to get my head round the songform and even - goddammit! - began to enjoy it. So, rough edges smoothed out, it was into the car and drive over to the small Black Country town of Bilston, home to two of the best live music venues north of Dudley: the Trumpet (for jazz) and the Robin2 for all things Rock and Americana. It was a Tuesday night and the audience weren’t exactly heaving, seated as they were on chairs in the middle of the dancefloor, but it was respectable enough. There was a support act already on the stage, a local band I think, called Dee Dee and the James Gang, more used to doing line-dance parties and small festival appearances than a sit-down type event with a quietly supping crowd, but they did their set well enough and one of the guitarists did a solo using some kind of filter effect that made his guitar sound exactly like a honky-tonk piano. Quite uncanny. Apart from that I can remember a Southern Cross flag and a Stetson hat and accents that couldn’t quite decide whether they were in the American Mid-West or the English Midlands. After a short interval Rachel and the Knock Outs came on stage and with little fuss set-up their instruments whilst we listened to the soundman's choice of country ballads. Now the rest of the line-up was bass guitar, electric guitar and fiddle, but I really have to comment on their drumkit. I must admit at first sight it looked exactly like one of those kids toy drumkits that you buy your six year old for Christmas for £50 and then instantly regret it. It was tiny! A small snare drum, a hi-hat (with a small tambourine jingle on top), a sizzle ride cymbal, a splash/crash cymbal and a teeny - at my guess - 14” by 8” mounted bass drum with a pair of boxing gloves painted on the front. I realised later it was ingeniously made from an old snare drum turned on its side and mounted on a stand. Especially small for ease of carrying. Aimee even stores her foot-pedal inside it. Now, that’s what I call thinking ‘inside the box’. Rachel herself struck me by how tiny she is too - like a little sparrow. But don’t let that fool you, this bird can peck. Without her trademark stetson (I think the support act stole a march on that one) she’d put her hair in two big pigtails instead and was wearing cowboy boots that were long in the foot, pointed and turned up at the end. This somehow forced her to walk heel first - presumably to give that authentic ‘just got off a horse’ gait. In fact they struck me as being nearer to Mexican botas vaqueras - I almost expected her to break out into a '3-ball zapateado'. Completing the picture a full-size pair of boxing gloves was hung from her microphone stand. (the Knock Outs - geddit?). And then, with a cheery “Well, howdy! 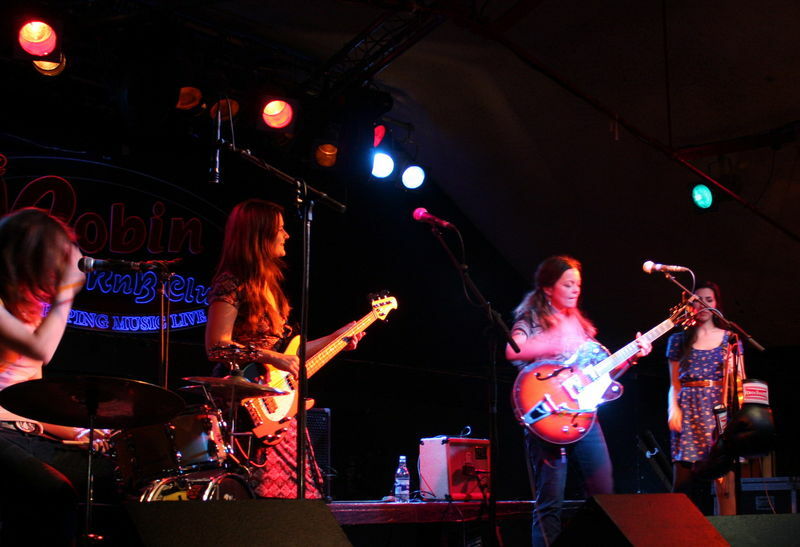 How ya’ll doing?” , Rachel and the girls proceeded to bring American Country to the Black Country. It felt like it took about 3-4 songs for everyone to settle down, both band and audience, but then Rachel, who has a good line in linking tunes with chat, regaled us with tales of their time in Netherlands and Belgium where they just toured immediately before pitching up in the UK that morning. They’d taken to the stage with only four hours sleep having travelled overnight on the Rotterdam-Hull Ferry, on which apparently the girls had had a lot of fun. I can’t imagine what. The road (or in this case, the sea) does funny things to you, so much so that upon arrival at UK Border Control they decided that the best way to address the Immigration officials was in their best faux New Zealand accents - a direct influence of the TV comedy programme "Flight of the Conchords" on their humour. Apparently UK Immigration still let them in even though they thought these four daft Yanks sounded more like South Africans than Kiwis . . . It didn’t stop them continually breaking into Kiwi throughout the gig to much mirth between themselves on stage. Border Control has a lot to answer for. I ought really to talk about the music here. Well, it was good. Very good. Look, I told you, I know jack about Country, but I can tell you this - they certainly know how to play and sing and I suspect that Rachel recruited the girls as much based on their abilities to harmonise as their obvious instrumental skills. Really nice blend of voices and instruments, so much so that you tend to forget the skill in the musicianship and concentrate on the delivery and the words. Which is a useful outcome - because Rachel’s lyrics and stories are too good to miss. By the time I put my camera down Rachel was describing how she took one of her older songs entitled “Sunshine Girl” and turned it from a waltz into a bluegrass renamed “Moonshine Boy”, a tune with some delicious 3-part harmonies courtesy of Rachel, Moe and Aimee (lovely use of brushes too on her drums). We were treated to another intro link, this time about their travels through Belgium - tales of tattooed women, ex-convicts and Belgian cowboys. Yep, you heard right. Belgian cowboys. A suitably surreal image from the country that gave us René Magritte . . . Apparently they travelled for hours deep into the countryside looking for this small venue. The big sign in English announcing “Steakhouse” kind of gave it away. Life on the road, even the Belgian one, is full of little surprises. 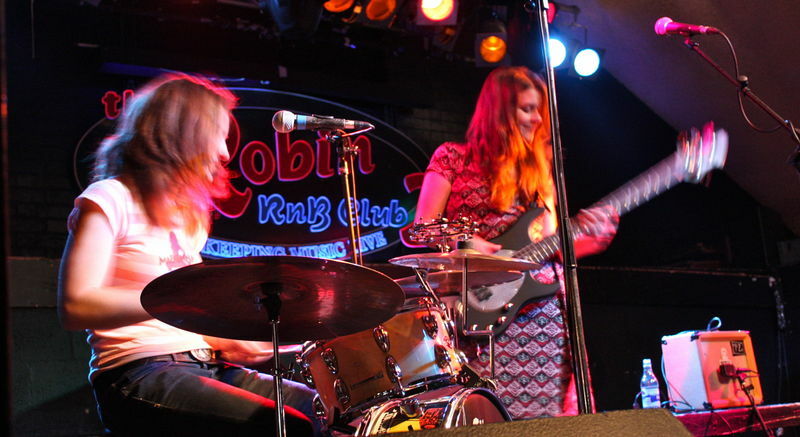 After a baseball-themed song called "Shoeless Joe", Rachel introduced us to the rest of the band “the lovely and talented” Moe Provencher on bass, Elisa “Legs” Milner ('Legs' for obvious reasons) and Aimee Tubbs on drums. Well, I wasn’t having that… I was most disgruntled. How come the drummer doesn’t get an epithet? Well for me, it has to be “Smiley Riddim” for her radiant face throughout the whole gig. There you go. And then in homage to the excellent Spinal Tap, Rachel informs us (in her best Kiwi accent) she’s going to turn her amp right up to 11 for the next one. A song which I think had something to do with being alone in the house after coming back off tour with no-one else but her boyfriend . . . It was called: “Nothing To Do But You” (ahem). The Knock Outs might be young but they have a genuine love of old school country. In fact they met backstage at an annual Patsy Cline tribute concert in 2011 and discovered a mutual love of honky-tonk, classic country, early rock, etc. The Knock Outs were born and there was even quite a few shots of whiskey to ‘wet the babby’s jed’ (as we say in the Black Country). Naturally enough this led into a Patsy Cline number called “Turn the Cards Slowly” - an up-tempo, two-step, bouncer with a very tasty drum-break from Aimee Tubbs. For some reason I kept thinking the song was going to break into “Ring of Fire”! Bass player Moe Provencher took the mic to return us to that Belgian cowboy bar of earlier. Apparently it had a huge video screen right opposite the stage that showed back-to-back rodeo coverage, throughout their gig. When they first met Rachel the other girls thought that she was just a 'city slicker hickster' who likes to play Country music. Little did they know that the little lady in the big stetson was actually a previous Barrel-Racing champion of Laine County. So stick that in your corn-pipe and smoke it. This of course caused problems in Belgium. It was the first time she’d played a gig where you were forced to watch a rodeo at the same time as playing - not a good idea! One part of her brain was occupied singing and playing the guitar, the other half was assessing the barrel-racing, bronco-riding and steer-roping abilities on the huge screen opposite. 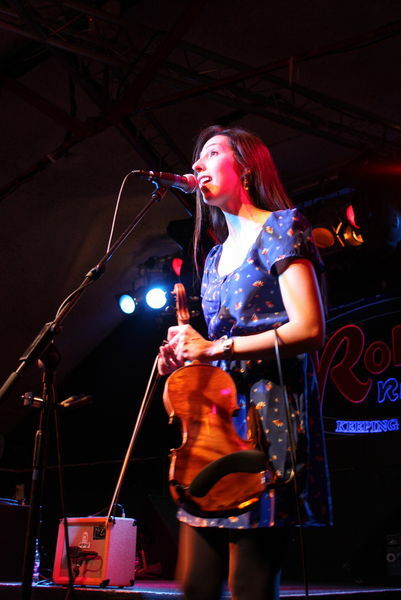 The risque-sounding “I’ll Show You Mine” (especially after “Nothing To Do But You” and “Get You Some”) turned out to be a slow ballad in ¾ time in which Alisa Milner displayed the beautiful tone she draws out of her fiddle. Not just a pretty pair of pins then. Talking of which, it turns out that both Alisa and Rachel went to the same university in Bellingham (the so-called ‘City of Subdued Excitement’ - no, really, it is!) where Rachel studied Environmental Studies and Alisa Cellular Biology. Add that to fiddling, barrel-racing, thumb-wrestling and massacring the New Zealand accent and really: what's not to like . . . The next song I confess I’d got quite worried about when listening to the album at home. Some of these Country types can be a little too 'fundamental' for my tastes and I was genuinely worried that the Knock Outs might secretly hold views a little to the right of George Dubya when it came to alternative lifestyles. Luckily I was reassured by them after the show that the rather acerbic (There’s a) “Hippy In My House” was entirely tongue-in-cheek and comic in intent. Phew! Very funny though! As was the next one the feminist ode: “Wedding Ring Vacation”. It was introduced to us as “a special song for a special man who was very close to me once - I now know him as ‘my ex-husband’. And then, before we knew it the end was nigh and we were being thanked for being 'real troopers' and turning out on a ‘school night’. The final number, “He’s My Man”, was a rabble-rousing rocker - or at least it would have been if they’d have been on a large festival stage in front of a heaving multitude of bevied 'rabble' ready to be roused. Still, the girls poured everything into it and we tapped our toes in time. Very satisfying end to the gig. Or was it . . . ? The Knock Outs left the stage, instruments in hand (including the drummer!) but then came down onto the floor right in front of us and stood in a line where they proceeded to perform a wonderful unplugged gospel called “I Don’t Want To Get Adjusted”. They even managed to finally get everyone singing along to the chorus! Lovely touch and much appreciated by the audience, who straightaway afterwards formed an orderly queue (you’ve got to love Britain sometimes!) at the little desk where The Knock Outs’ and Rachel’s CDs were being sold from. It was signed-copies all round and still time for a cup of hot cocoa before bed. 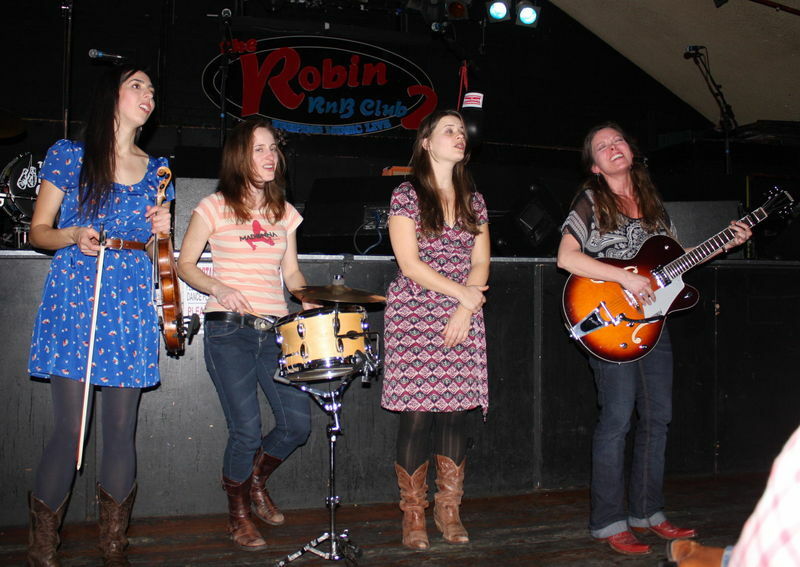 So there you go, four talented country girls unleashed on an unwitting Europe. I bet the Belgians and the Dutch didn’t know what hit them. So, all you Countryphiles here in the UK, don’t say I haven’t given you good notice. Forewarned is forearmed. 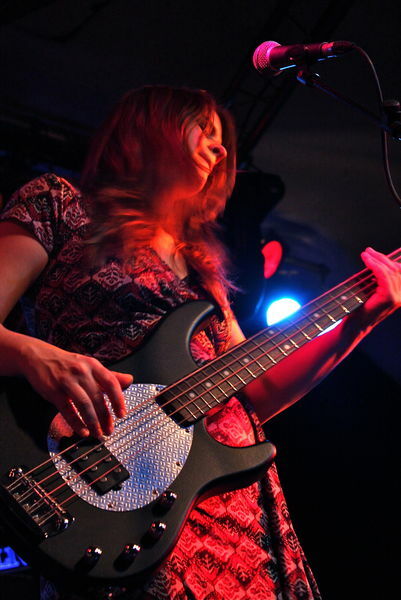 Rachel and the Knock Outs will be getting up to all kinds of shenanigans the length and breadth of Great Britain until April 5th - and might even manage to fit playing some excellent music for you into all this too . . .